The BeautyPro Hand & Foot Renewal Set combines three luxurious masks to leave skin feeling soft, hydrated and revitalised. A dual-function foot peel that effortlessly smooths feet, whilst offering antibacterial action. Created with an advanced complex of 17 Natural Plant Botanicals, the single-use socks encourage the elimination of dead skin over seven days. Simply wear for up to two hours and the treatment promotes the peeling of dead skin for the following week after application. An innovative, dual-function foot mask that hydrates and nourishes feet in need. Infused with a cocktail of beneficial ingredients, including Marine Collagen, Shea Butter and Vitamin E, the single-use socks feature removable toe tips, and can be worn whilst painting nails for a truly pampering experience. Working in just 20 minutes, feet will be left feeling soft, supple and comfortable. 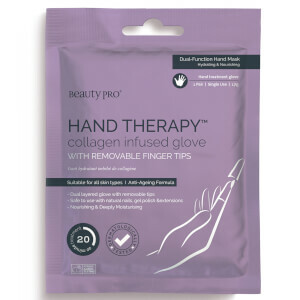 The single-use gloves simply slide onto hands, instantly delivering an anti-ageing cocktail of ingredients to skin. Enriched with a skin-loving dose of Marine Collagen, Shea Butter and Vitamin E, the masks envelop hands in a veil of rich moisture that thoroughly nourishes skin with long-lasting effect. Arriving with removable fingertips, the dual layered glove can be worn whilst continuing to go about the day, or when working on nails. Foot Peel: Cleanse and dry feet. After removing booties from packaging cut along the cutting line and place feet into booties. Wear for 90-120 for maximum results. Remove booties and wash hands and feet thoroughly. Dead skin will naturally peel away after 7 days. Leave 6 weeks between use. Foot Mask: Simply cleanse the feet and then slide your feet into the booties. Remove the toe tip if required and then remove after 20 minutes. Once removed, moisture and work into the feet the excess serum and allow to dry. Hand Mask: Simply cleanse the hands, slide your hands into the gloves. Remove the tips if required and then remove after 20 minutes. Once removed, moisture and work into the hands the excess serum. 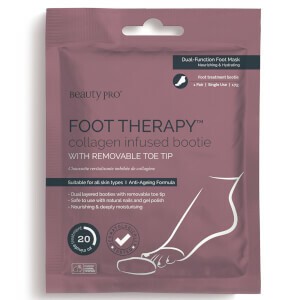 Foot Peel: Salicylic Acid (BHA Complex from fruit extracts), Glycolic Acid (AHA Complex from fruit extracts), Sage, Anise, Lavender, Olive, Acerola, Kiwi, Banana, Honeysuckle, Peach, Chamomile, Gingko Biloba, Rosemary, Vitamin-E, Lemon and Lime. Foot Mask: Argan Oil, Rose Water, Shea Butter, Marine Collagen, Vitamin-E, Peppermint, Ginkgo Biloba, Salicylic Acid (BHA Complex), Sweet Almond, Chamomile, Honeysuckle, Peach, Anise, Apple, Lemon, Orange, Olive, Grape and Lime. Hand Mask: Argan Oil, Rose Water, Shea Butter, Marine Collagen, Vitamin-E, Extracts of Anise, Apple, Lemon, Orange, Olive, Grape and Lime.